Martin DeWitt earned a B.S in Aerospace Engineering from North Carolina State University, an M.Ed. from the University of North Carolina at Greensboro, and a Ph.D. in Physics from North Carolina State University. 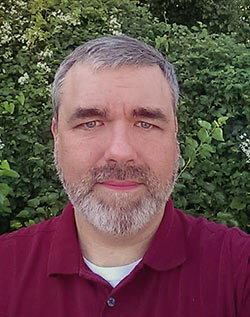 Dr. DeWitt served as an Instructor of Physics from 2008 – 2010 and as an Assistant Professor of Physics from 2010 – 2018 at High Point University (HPU), where he had the pleasure of working as part of a team to build a new physics program (est. 2010). He served as advisor for HPU’s Society of Physics Students chapter from 2012 – 2018 and taught a wide range of courses, from first-year seminars to introductory physics for non-majors to senior-level courses for majors. Alongside his students, Dr. DeWitt participated in a number of annual outreach activities including HPUniverse Day, The Piedmont Science Fair for Non-Public School Children, Boys and Girls Club Science Fairs, and ‘Math and Science Night’ at a local elementary school.